Also known as the blockbuster season, the Lunar New Year holiday week is always a feast for moviegoers. However, this year, one film managed to stand tall among all heavy-weight competitors. Directed by Frant Gwo (郭帆), the Chinese sci-fi film The Wandering Earth <流浪地球> surpassed the likes of Stephen Chow’s (周星馳) The New King of Comedy <新喜劇之王> and the Hong Kong crime film Integrity <廉政風雲 煙幕>, becoming the top dog of 2019’s Lunar New Year time slot. Welcomed with overwhelmingly positive reviews, The Wandering Earth smashed the Chinese box office by grossing 1 billion yuan in four days. 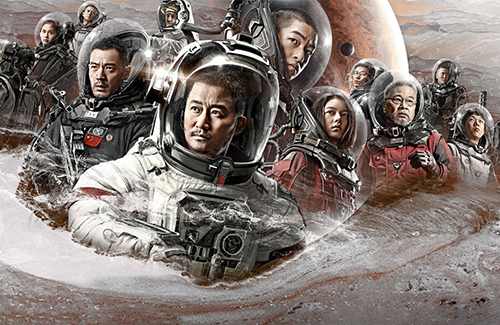 As of February 9, 2019, The Wandering Earth grossed over 1.2 billion yuan—earning back nearly four times its budget. Based on the novel of the same name written by Cixin Liu (刘慈欣), The Wandering Earth is set in a time when the sun is quickly dying, and all of humanity has to work together to move Earth out of the sun’s orbit before the sun could destroy the entire solar system. The film stars Qu Chuxiao (屈楚萧), Li Guangjie (李光洁), Ng Man-tat (吳孟達), Zhao Jinmei (赵今麦), and Wu Jing (吴京). According to reports, Wu Jing was originally billed for a special guest appearance. However, upon hearing that the film crew were underpaid, the Wolf Warrior <战狼> star decided to invest 60 million yuan into the film, becoming one of the film’s producers. Wu Jing now has another hit in his stellar resume.